Margaret graduated from Rutgers College in 1980 and received her law degree from Seton Hall University School of Law in 1983. She has been admitted to the bar in New Jersey since 1983 and in 1987 was admitted to the Virginia bar. For many years, Margaret worked as a litigator, defending personal injury suits, large construction claims and property damage claims. In the last few years, Margaret has begun handing more “general practice” cases, with an emphasis on preparation of estate documents, real estate and family law. 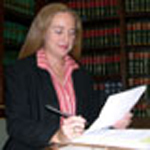 Margaret is currently a member of the New Jersey State Bar Association, the Monmouth County Bar Association and the Ocean County Bar Association.